Undeniably confident, this bold structural cuff is lavishly plated in 18K gold. Styled with an exquisite elephant - the symbol of strength, power, stability and wisdom - this memorable piece is designed to be noticed. It's believed that if an elephant's trunk is upturned, it will shower all who pass by with good fortune. We say, how could it not? 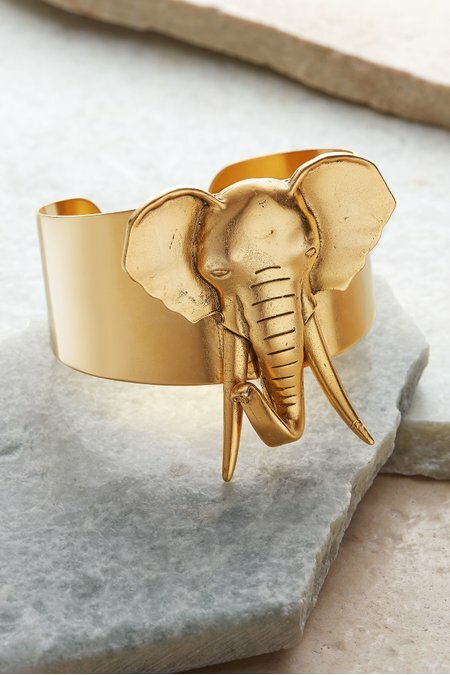 Widest width of cuff 1-1/2"
Widest width of elephant 2-1/4"